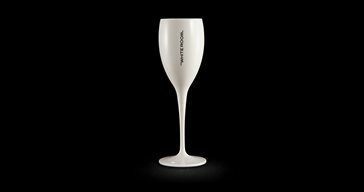 Our popular Moët glasses with your own printing are made for tough usage in, for example, night club environments. The plastic is very durable and the material is acrylic. These glasses are available in many colors, please see below. If you wish another color than mentioned, please feel free to contact us. We send you a design draft for you to confirm before we start the production. If you request more than 200 pcs please email us. The price per unit is decided of the quantity, the bigger quantity you order the cheaper price per glass. Colors: black, white, red and pink. We have more colors if you ask us. Please write what color you request in the message field in the cart when you make an order.